Offshore wind farms with high installed capacities and located further from the shore are starting to be built by northern European countries. Furthermore, it is expected that by 2020, several dozens of large offshore wind farms will be built in the Baltic, Irish and North seas. These wind farms will be constituted of a considerable number of turbines packed together. Due to shadowing effects between turbines, the power production is reduced, resulting in a decreased wind farm efficiency. Moreover, the collection system length and complexity rapidly increase with the number of wind turbines installed, resulting in higher investment costs and power losses. Hence, when large wind farms are considered, wake losses and collection system total length are important aspects that need to be optimized. Nonetheless, designing a large offshore wind project is a very complex task. In the development phase, an enormous amount of time is used to generate feasible wind farm designs. For example, the manual layout optimization and cable routing are highly time consuming. Amongst others, this drawback leads to offshore wind projects with very high investments costs. In fact, electricity generated offshore is, up to today, substantially more expensive when compared to onshore wind or combined cycle gas turbines. Wind farm layout optimization is a possible solution to further increase the efficiency of wind projects leading to lower prices of energy generated offshore. Moreover, investment costs would be reduced if the collection system could be automatically designed via optimization tools. The aim of this work is to obtain optimized offshore wind farm layouts with enhanced energy production while considering the seabed constraints, e.g. maximum sea depth, inappropriate soil types and large seabed gradients. Through the use of optimization tools it is also desired to alleviate the designer teams of mundane manual layout optimization and cable routing. The optimized wind farm layout obtained presents higher energy yield. Although, the collection system total length is higher than for the standard case, the overall system efficiency is improved. Moreover, installation costs of the collection system were reduced through the avoidance of challenging areas of the wind farm. The wind turbine support structures costs were also reduced since deep areas of the seabed were avoided. In this work it is presented a novel optimization tool to obtain optimized offshore wind farm layouts while taking into consideration the seabed profile. Due to the increased offshore activity in recent years, as well as the expected installation in the coming years, this tool becomes very important and relevant for the offshore field. Rodrigues, S.F, Bauer, P, Bosman, P.A.N, & Pierik, J. (2014). 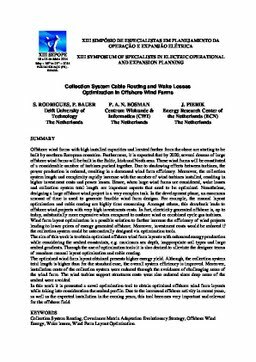 Collection Network Cable Routing and Wake Losses Optimization in Offshore Wind Farms. In Proceedings of Symposium of Specialists in Electric Operational and Expansion Planning 2014. CIGRE.